According to Yahoo news, Brown Bear, Brown Bear, What Do You See? 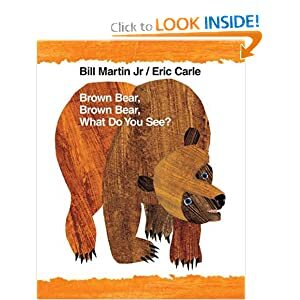 written by Bill Martin & illustrated by Eric Carle was banned by the Texas Board of Education in January 2010 because they mistakenly thought it was written by the same Bill Martin who wrote Ethical Marxism: The Categorical Imperative of Liberation. TEXAS, IF YOU ARE LISTENING, NONE OF THE ABOVE BILL MARTINS WROTE THIS BOOK! I have been wanting to start a "Banned Book Club"! Wouldn't it be fun to just read books that have been banned?! This would include Thomas' Snowsuit by Robert Munsch and Anne Frank's Diary... Sad but true.